Full fleets from Lexus and Vespa will be driving on the 100-mile course from New York City to Bear Mountain and back alongside nearly 5,000 cyclists from over 70 countries. In addition, both Lexus vehicles and Vespa scooters will be present at GFNY’s pre-race expo, NYC Bike Expo, on May 16-17. Lexus is the Official Automotive and Vespa is the Official Scooter of the 2014 Campagnolo Gran Fondo New York. This fourth edition of the event marks the first year that Lexus and Vespa partner with GFNY. Both brands will be at NYC Bike Expo and along the Campagnolo Gran Fondo New York course to provide cyclists a fantastic race day experience. Vespas will be mainly used by race marshals, the media, film crews and photographers. But Campagnolo will also utilize some of the Vespa fleet to provide mechanical support because Vespas are smaller and hence their drivers can move through groups of cyclists faster to get to riders who are in need of mechanical assistance. 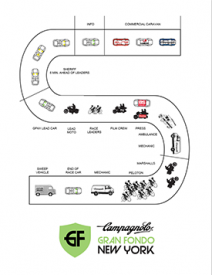 The 4th annual Campagnolo Gran Fondo New York features the world’s most international peloton with riders from over 70 countries and 48 US states. The athletes will take on a challenging 100-mile route from NYC to Bear Mountain and back to compete against each other, the clock and themselves in a personal endurance challenge. The 50-mile GFNY BEAR on the same day is a non-competitive ride from NYC to Bear Mountain, to celebrate the park’s 100th anniversary. New for the 2014-2015 season, GFNY WORLD features events in Italy, Mexico, Puerto Rico, Colombia, Spain and Brazil that lead up to the Championship in NYC on May 17, 2015. Campagnolo Gran Fondo New York raises funds for Operation Smile, the international children’s medical charity. The official Grand Fondo New York website is: www.granfondony.com.